Winter in southern Montana’s Yellowstone Country doesn’t just change from minute to minute, but from one mile to the next. It’s a character every bit as interesting as any wild-eyed local who might take a seat next to you in the bars. And, like a wild-eyed local, if you make friends with its unpredictable nature, you’re going to find yourself in some situations that will spawn stories for years. Here’s seven you could be telling. All summer, Yellowstone National Park is a hive of controlled chaos. Over four million tourists descended on the park in 2016, but 90% of them arrived between April and September. For winter travelers, the park feels almost empty, especially when you leave behind the snowmobiles on the main roads. Once snow has fallen, Yellowstone’s rolling hills and wide meadows are perfect terrain for cross-country skiing, letting you get deep into the backcountry. Head a few feet down any trail and the only sounds are the shoosh-shoosh of your skis, the beating of your heart, and the surprisingly loud hiss of snow falling through the trees. Trails like the Mammoth area’s Upper Terrace get most of the traffic, so getting out into the backcountry on trails like Sheepeater offer a level of solitude rarely seen within park boundaries. Link it with Bunsen Peak Trail for phenomenal views of Gardner River Canyon and the Gallatin Mountains. And don’t forget to make time to relax in the Boiling River, where a hot spring pours steaming water into the chilly Gardner River, turning it into nature’s jacuzzi (remember that the hot springs are a no-go for dipping, as they’re protected — but you can jump in the river itself). You might see eagles soar overhead, searching for fish in the rapids, and bighorn sheep tend to show on the far side of the river for a drink before heading back up the canyon. 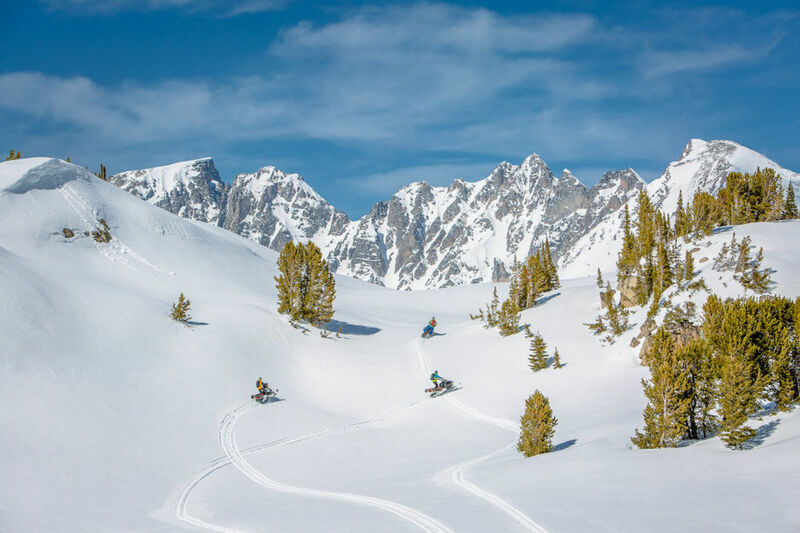 The quirky little town of Cooke City has gained a reputation as a top destination for snowmobilers due to its consistent, heavy snows all the way into mid-spring. But waist-deep powder is really just a pretext for what makes this place epic. During the winter — and around here, winter can start in October — the gates close on Highway 212, and the only way in or out is the winding road through Yellowstone National Park between the North Entrance and the Northeast Entrance at Silver Gate. The road’s dead end gives Cooke City a remote, end-of-the-line feeling, even when the streets are filled with revving snow machines. And it’s best to join them. After topping out at near 10,000 feet on the Daisy Pass Trail, you’ll get a sense of just how vast the landscape here really is (the national park is bigger than Rhode Island and Delaware combined). Towering peaks fill the horizon in every direction, taunting your high marking skills, while sprawling, untracked meadows beckon you to mash the throttle to the bar. There’s really nothing like it. In a region with a lot of spectacular ice climbing, Bozeman’s Hyalite Canyon has to be near the summit of the list, thanks to it broad appeal. It may not have as many long, multi-pitch climbs as other spots, but what the canyon offers is a high density of routes (over 150), consistent ice, and short enough approaches that you can spend all day without having to go back to your car. Classics like Cleopatra’s Needle and the famed Winter Dance will leave you with a silly grin on your face and a reason to come back next year. Nothing gets you closer to the locals than sharing a 10’x10′ warming hut over a four-foot hole augered out of lake ice. Ice fishing has a long tradition in West Yellowstone, where winter temperatures dive well below freezing (often below zero) and stay there for months on end. Nearby Hebgen Lake is the go-to spot in the region. Ringed by mountains and easy-to-access public lands, Hebgen is legendary thanks to the trout pulled from its icy waters — rainbows and browns average 14-18 inches here. And while the fishing is great, it’s the heritage of the sport that makes it such a memorable experience. Sitting with a couple of friends in a rickety ice house, with a few beers pulled out of a box torn open with thick-gloved hands, makes the cold worth it. Or maybe it’s wrestling a 20-inch rainbow out of a hole barely big enough to fit that does it. Either way, it’s a win. Big Sky Resort is probably the best-known ski area to those outside Montana, attracting tourists from all over the country. And while it’s a great time if you’re looking for resort trails, going out of bounds is oh so worth it. Yellowstone Country has several major mountain ranges — Madison, Beartooth/Absaroka, Bridger, Tobacco Root — and each gives a backcountry skier years of shreddable lines. While there are guidebooks to the backcountry powder stashes, you’re best bolstering that knowledge with local beta. One of the best places to run laps on fun, low-angle powder is Telemark Meadows, just inside the western boundary of Yellowstone National Park. While the easy approach means you won’t be alone, there is so much terrain that finding fresh powder won’t be a problem. Mount Blackmore, outside of Bozeman, offers a ski mountaineering option that lets you drop in right off the 10,000-foot summit. Bagging the peak takes more effort, but the terrain and view from the top are worth it. Beginner’s note: It should go without saying that backcountry skiing is not a solo activity. Take someone you trust to literally dig you out of an avalanche, and going through avalanche training should be viewed as a requirement. If ski mountaineering doesn’t quite seem Western enough, check out skijoring. It originated in Scandinavia as a way to get around, but has since morphed into a competition where dogs, horses, or snowmobiles pull skiers at high speed through a course of jumps, slaloms, and other maneuvers, water-ski style. 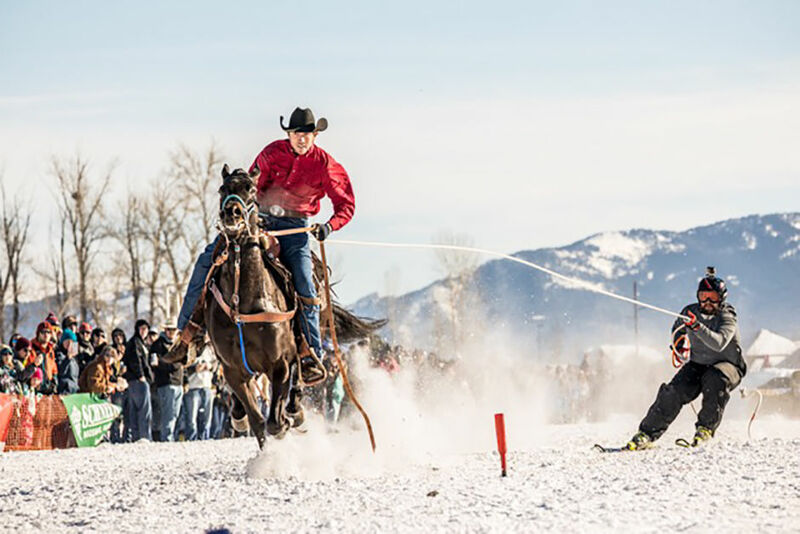 Each March, cowboys and skiers gather in Red Lodge for the Skijoring National Championships. The contestants are the best in the nation, ensuring things get wild out on the snow. Watching skijoring, it might start to look easy. If you think you have what it takes, the Gallatin Valley Skijoring Association, based out of Bozeman, puts on a novice class in the Montana Duckworth Classic to encourage newbies to give skijoring a try. Grab a pair of Carhartts and, when you’re done, send us the video. Whether winter adventures have you climbing rock or ice, skiing chutes or being pulled by a galloping horse, at the end of the day, you’re probably looking for a warm fire and a stiff drink. With craft beer heavy hitters like Bozeman and Billings, finding a lively taproom to recount your stories is easy. Sam’s Tap Room in Red Lodge offers seven year-round beers on tap (plus plenty more seasonals) as well as a fireplace to crowd around. What more do you need? To top it off, there’s a crackling distillery scene here, too. In Bozeman alone, you’ve got Bozeman Spirits Distillery, Wildrye Distillery, and Dry Hills Distillery. Hold your snifter and listen as those around you talk about ice fishing and snowmobiling in the nonchalant way that only people who live surrounded by so much nature do — as if the adventures you’ve been chasing aren’t really adventures at all. And then, one of them says, “Looks like we’re going to get another six inches on the pass.” There’s a pause before someone replies, “I have a feeling I’m going to get snowed in tomorrow, and can’t get to work.” The others chuckle. Yep. Long live those long Montana winters. This post is proudly produced in partnership with Yellowstone Country, Montana.